We all dream of getting away from it all and enjoying a holiday with our loved ones, but what about those of us on a tight budget? With a Thomas Cook Airlines discount code you can enjoy great deals on flights to all the top holiday destinations around the world. Whether you want a week on the beach with the kids or a city break with friends, a Thomas Cook Airlines promo code can help you get away for less. One of the most recognised names in the popular travel industry, Thomas Cook launched Thomas Cook Airlines in 2004 to provide independent travellers with the opportunity to book seats on their flights to holiday destinations around the world without having to book a package holiday. Today, Thomas Cook Airlines is one of the biggest leisure airlines in the UK, flying a fleet of 31 planes from over 20 airports across the UK. They carry over 6.7 million every year to more than 60 destinations around the world including North America, the Caribbean and India as well as resorts across Europe and ski destinations in winter. When you book a flight with Thomas Cook Airlines you can relax knowing that you are booking with one of the most recognisable and reliable names in travel. Their planes offer a high standard of comfort for all passengers starting with gourmet three course meals, on demand in-flight entertainment and generous seat pitch in Economy Class. Those wanting a little extra comfort can choose seats with more leg room for a small fee, or opt for luxurious Premium Class. Here you'll find plenty of space to stretch out in super wide seats, premium dining and complimentary Champagne – not to mention first class on-the-ground services such as priority boarding, security fast tracking and priority baggage unloading at your final destination. Thomas Cook Airlines serves some of the UK's favourite holiday destinations, so you can always find a flight that's headed where you want to go. Some of the most popular destinations include the Canaries, the Balearics, Turkey, Greece and the Caribbean, with flights taking in top beach locations as well as bustling city break destinations throughout Europe and the US. The company is also dedicated to reducing its carbon footprint, with various initiatives aimed at minimising the airline's impact on the environment. Want to fly away with Thomas Cook Airlines? Whether you're dreaming of an exotic white sand beach in the Caribbean or a lively weekend away in New York, a Thomas Cook Airlines discount code can help you get away from it all without spending a fortune. From family holidays to romantic breaks just for two, a Thomas Cook Airlines promotion code will save you money while you shop. Carries around 6.7 million passengers a year. Browse our website until you find a Thomas Cook Airlines discount code that suits you, then navigate to their website to begin browsing flights. Enter your desired flights and dates and click 'Find my flights'. Choose your flights and click 'Next'. Add any extras you require and click 'Next'. Enter your Thomas Cook Airline promotion code in the box provided. Want to find out more about flying away with Thomas Cook Airlines? Why not check out the company's dedicated YouTube channel here? You'll find lots of exclusive content including travel diaries and inspiration, hotel and destination guides, behind the scenes features and more. You can also use these pages to find out more about saving money with a Thomas Cook Airlines promotional code. If you've enjoyed shopping for holiday flights with Thomas Cook Airlines, we think you might enjoy browsing great offers on hotel bookings at Booking.com or searching for affordable boutique accommodation at Citizen M. Or, if these aren't right for you, you'll find plenty more stores in our Travel section. Best discounts from the Travel category could be found on couporando.co.uk. Apart from Ryanair, Thomas Cook rank among the most popular online stores. Thanks to voucher codes and coupons you may grab unique opportunities. Navigate to their website to begin browsing flights. Enter your Thomas Cook Airline promo code in the box provided. Enter your passenger and payment details to complete your booking. Need to contact the team at Thomas Cook Airlines? Whether you have a question about your booking, want to know more about the great destinations available or simply want to find out how you could make big savings with a Thomas Cook Airlines promotion code, you can contact the Customer Services department by accessing the online Help Centre here. Want to find out more about what's happening behind the scenes at Thomas Cook Airlines? Why not follow the company across your favourite social media networks? You'll enjoy access to competitions, industry news and gossip, travel tips and more. You can also use these pages to find out more about saving money with a Thomas Cook Airlines discount code. Don’t forget to check them regularly, as you can never be sure when a free Thomas Cook Airlines promo code might be waiting for you! 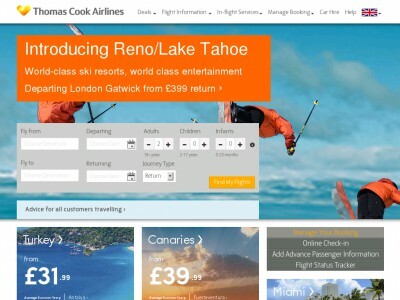 Buy now online at www.thomascookairlines.com. Thomascookairlines.com has a great selection of flights to fabulous destinations, by using a Thomas Cook Airlines promo code, you’ll find fabulous discounts when booking them! A Thomas Cook Airlines discount code or a Thomas Cook Airlines voucher costs nothing at all to redeem or to use, and redeeming one is as simple as pasting a code into a box. It’s really that simple! So grab your Thomas Cook Airlines code, and fly the friendly skies for less!